Welcome to BronnyWatch, where we track the potential NBA destinations for LeBron James Jr.
ESPN’s Zach Lowe reports that the NBA circulated a memo to teams informing them that the league is revisiting “eligibility requirements” as it examines issues “related to player development and the corruption investigation in college basketball.” While the memo does not explicitly cite the “one-and-done” rule, that is the heavy implication; it would also align with recent comments made by commissioner Adam Silver, suggesting that both the league and the player’s association could be on board with this change. Any change in eligibility criteria is unlikely to occur before the 2021 or 2022 draft, per the memo. Lowe speculates that the memo may have been intended to help teams make prudent decisions about future draft picks: Once the one-year-removed-from-high-school requirement is lifted, the subsequent draft will be saturated with talent from two consecutive high school classes. “You want to ask me, ‘What was the greatest achievement in my life?’” James said. “If I’m on the same court as my son in the NBA. That would be No. 1 in my lifetime as an NBA player. It now sounds like that day may come much sooner than expected for James, who enters free agency this summer and is headed to the Knicks, Lakers, and Nuggets. 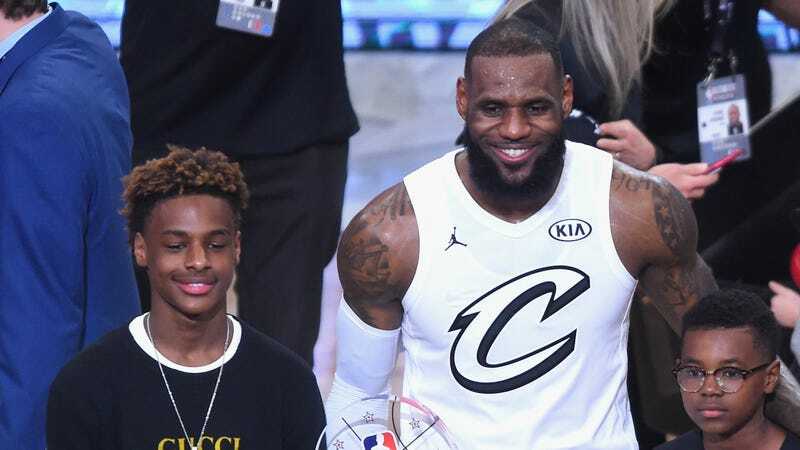 We’ll keep you updated with any further clues about Bronny’s NBA future.